What is the ICD-10 Code for Friedreich’s Ataxia? The ICD-10 Code for Friedreich’s ataxia is G11.1. G11.1 is a billable/specific ICD-10-CM code that can be used to indicate a diagnosis for reimbursement purposes. The 2018 edition of ICD-10-CM G11.1 became effective on October 1, 2017. This is the American ICD-10-CM version of G11.1 - other international versions of ICD-10 G11.1 may differ. ICD-9-CM 334.0 is a billable medical code that can be used to indicate a diagnosis on a reimbursement claim, however, 334.0 should only be used for claims with a date of service on or before September 30, 2015. Friedreich's ataxia, also known as FA and FRDA, is an inherited disease causing nervous system damage and movement difficulties. Typically beginning in childhood, Friedreich’s ataxia leads to degrading muscle coordination over time. Friedreich’s ataxia affects the spinal cord and peripheral nerves. The brain’s cerebellum, which controls balance and movement, also degrades. This damage results in unsteady movements and impaired sensory functions. The condition also causes problems in the heart and spine, and some develop diabetes. The disorder does not affect intellect. Friedreich’s ataxia is caused by a mutation in the gene, FXN. The condition is recessive, only occurring when someone inherits two copies of the gene, one from each parent. Although rare, Friedreich’s ataxia is the most common form of hereditary ataxia, affecting about 1 in every 50,000 people in the United States. Both male and female children can inherit the disorder. The condition is named after Nicholaus Friedreich, the German doctor who first documented the condition in the 1860s. 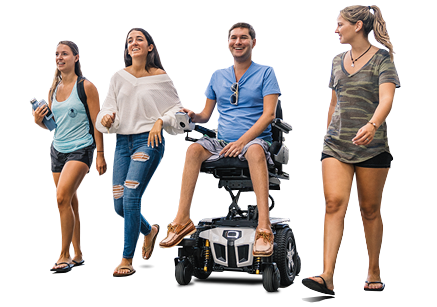 Quantum Rehab, the global leader in clinically-based, user-inspired power wheelchairs, offers technologically-advanced models specifically meeting ICD Codes for Friedreich’s ataxia, including ICD-10 G11.1. For more information, please click here.